Cher’s new site has the amazing feature of a loader screen which counts up in roman numerals, and is followed by a “Quick, turn down the speaker before the neighbours hear” medley of her hits. 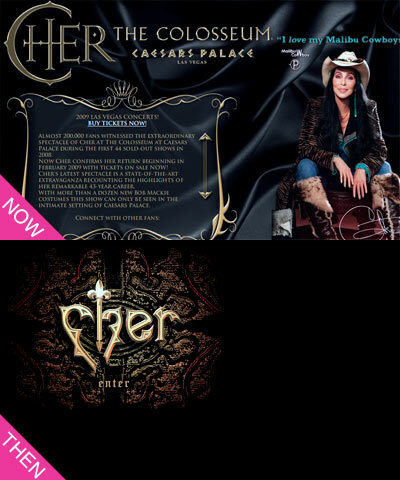 It says “(c) 2002-2010 Cher.com”, and yet the site was started in 1998. What was there between 1998 and 2001 which she is trying to deny ever existed? Hmm. 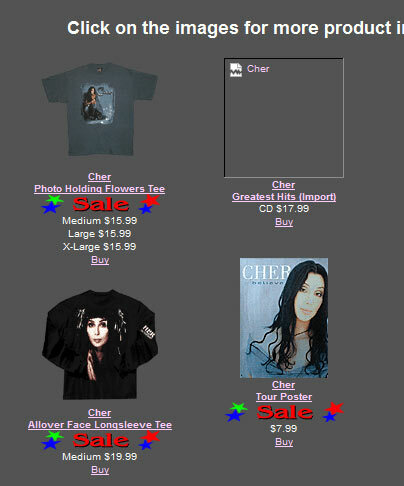 What would I like in an online Cher store? A plastic false bottom with a pen to draw on some tattoos? A mouse mat in the shape of her head? 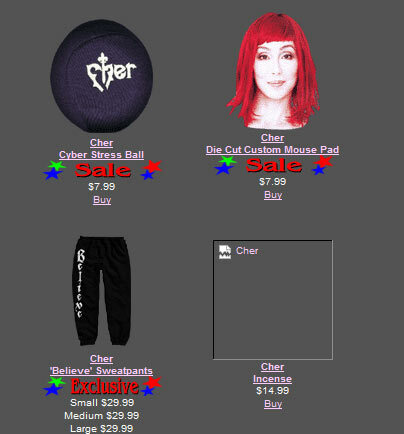 Cher sweatpants? A Cher stress ball for the next time “If I could turn back time” comes on the radio? Incence? I knew she wouldn’t let us down! This entry was posted on April 14, 2010 at 8:52 pm	and is filed under Cher. You can follow any responses to this entry through the RSS 2.0 feed. You can leave a response, or trackback from your own site.